Watching Durham Bulls Baseball: Game 3 to the Durham Bulls; One More for the Cup! 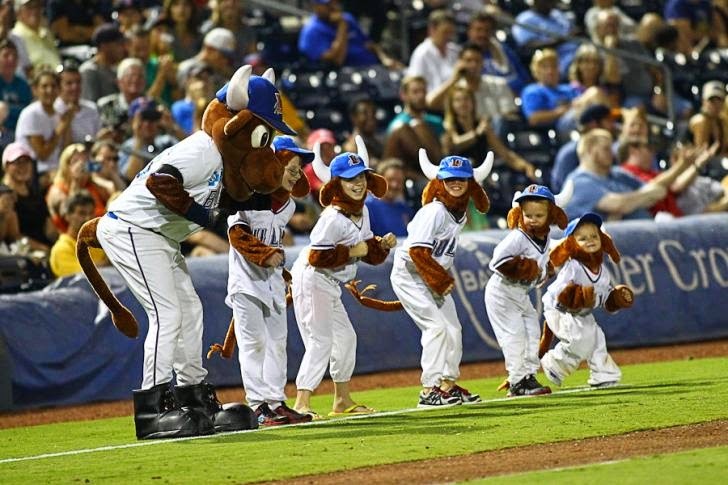 Wool E. Bull and friends dance for the crowd last night. The moment that I circled on my scorecard last night was Cole Figueroa’s at bat in the 3rd inning. Justin Christian had led off with a double and the Bulls were down 0-2 after the Pawsox scored single runs in the 2nd and 3rd innings. The Sox’s Henry Owens wasn’t quite cruising, but he had not seen any real trouble either. Figueroa stretched him out to at least 8 pitches (my count may be off) and on the 9th pitch he hit a very sharp grounder to short. Christian took off for 3rd base. Shortstop Deven Marrero chose to throw to 3rd, threw it high, and the Bulls ended up with runners on 1st and 3rd, nobody out. Jeremy Moore’s single brought Christian home. Tim Beckham’s double brought Figueroa and Moore home. As it turned out, Nick Franklin’s solo home run in the 6th was the key run, but the Bulls had to get those first three runs across first. What a change to have a starting pitcher set the stage. For the second time in the playoffs Matt Adriese did his job and did it well, going a full six innings. In the 5th he was going so well that he struck out the side. In the 6th he was still looking good, but his pitch count was into the high 90’s and it was time to change. Both relievers had pitched on Thursday night’s marathon, but they were back and did just fine. I thought that the game was in the bag after C.J. Riefenhauser got out of trouble in the 7th and had a clean 8th. However, as he often does, Josh Lueke provided some last-minute, not particularly welcome, thrills. The unearned run that scored in the 9th was the first run of any kind against Bulls relievers in this entire series, something like 16+ innings. That’s a testimony to the relief corps even as it says something sad about the starting crew. I also want to call out Wilson Betemit’s glovework at first base. For some reason everyone, right and left handers alike, were slapping stuff towards right field last night and a couple of them went right down the line. Betemit grabbed at least two that I recall that if not stopped would have created real problems. Weather is threatening tonight and it looks even worse for tomorrow. Mike Montgomery, who had a pretty decent outing back on August 28th, is scheduled to be the starter. New guy Bryce Stowell is in the bullpen since Nathan Karns starts tonight for the Tampa Bay Rays and the Rays finally took him off the Bulls roster. You have to expect both managers to go all in tonight. All of Durham’s relievers except Riefenhauser and Lueke are available. Even, as Scott Pose suggested last night, Enny Romero could be available for a batter or two for a couple of 98+ fastballs. The Pawtucket starter is making his first appearance at Triple A level. The Bulls could take it all tonight, and wouldn’t that be grand?